The taste of a fresh, warm churro in a vape. A dusting of light cinnamon and sugar flavor over dough for an authentic Mexican doughnut experience. Delish! I don't even know where to start. This stuff is awesome, right out of the mail. I ordered Churro, Vanilla Love, sweetner, and received small samples. I immediately opened them all to smell them, and was so excited that I actually squealed and did a little happy dance. Just from the smell!! I havent tried the other flavors yet but I can tell they will be amazing as well. I couldn't be happier. I was worried that all these awesome reviews could be fake, and they are SO NOT FAKE! I don't know how they got all the flavors of a churro in this stuff, but I don't care! It also tastes just like a cinnamon sugar cronut, if you've never had a churro. I'm currently vaping this with my Saturday morning coffee. Great start to the day. Happy Vaping! This e juice it TOTALLY delicious!!! I tried it straight out when it came and I can't get enough of it!!! I definitely will be buying more!! Thank you Altcig Crew!! Ya'll are awesome!! Thank you so much for my order and the personal message!! I fell off the vape wagon, but finally getting back aboard! I ran straight to the best e juice company there is to order me some juice!!! Thank you so much for all you do!! I love this flavor. It reminds me of eating at a Mexican restaurant and you can't wait till the desert comes out. I highly recommend this flavor to people who like the sweet juices. I am new to vaping, and received this as a sample when I ordered Vanilla Love and RY4. I was pleasantly surprised, as I am new to vaping and never thought I would like a cinnamon flavor. It has become my morning vape, and I am ordering more. great taste, just as your description says, although, I have not received a bad tasting product from you yet. I'll have to give it a 5 star rating. This came as a sample gift with my order. I has briefly glanced over the product before and had thought about it, but didn't order. Well I will definitely be back for more because this flavor is absolutely amazing! I can't say enough about it! I'm enjoying this almost more than the flavor I initially ordered!! Thanks for the sample AltCig because I am hooked on this! This flavor is cinnamon sweet goodness! It's as good as the reviews say!! I am a customer for life not only because of the amazing flavor selection, but because of the A+ service that comes with a personal handwritten note. Thank you so much, I will eventually review every flavor in my order!! I'm absolutely in love with this juice, the flavor is true to it's name. I can't put it down. You can taste the cinnamon and sugar on the tip of your tongue and on the exhale a yummy doughnut! I need a bigger bottle, NOW lol Altcig has the best juices I've ever tried and I've tried many from other vendors. I read some great reviews about this flavor on the e-cig forum and thought, "really? churro flavor? gimmie a break." But I gave it a shot. Wow! How did they get a churro in that little bottle? This is perfect .. the dough, the cinnamon and the sugar, which is the best part. It's not just a harsh cinnamon, it truly is cinnamon-sugar. It reminds me of being at the pool as a kid. Well done! best free sample ever !!!! This is so far the best juice flavor I have yet to taste. I have never heard of a churro before up here in the great white north of Maine But received this as a free sample (which is an incredibly generous move by Altcig) and just can't get enough. This is now my all day vape and will continue to be as a just ordered a large bottle. Oh and the Altcig company is just a stand up company that will always get my business and I will push all others over to them. Shipping is incredibly fast, a hand written thank you note, and free samples is just above and beyond what you get from any other company! This is one of the first flavors I ordered and omg I cannot put it down!! Hands down the BEST flavor I have ever tried, and I have tried a lot of flavors and vendors. IT TASTES EXACTLY LIKE A CHURRO!!!! I have never said this about any flavor before. You get the cinnamon and the Mexican doughnut taste. I ordered a 15ml bottle initially to try... and a week later bought a 65mg bottle! It has been all I've been vaping since. You are silly if you don't order this flavor!!! If you like cinnamon this is the flavor for you. I don't know how they do it, but all of altcigs flavors are spot-on to the real thing. Just close your eyes and smell the bottle and you think you are about to bite into a cinnamon & sugar pastry! Well done guys! Best Vendor, Best flavors, Best Prices. These reviews aren't just hype, I have tried a lot of their juices and they have all been excellent. Churro is a must have, all day vape. Their customer service is top notch bar none, super fast shipping, and the personal touch with each order speaks volumes! Keep up the great job, you've got a customer for life. Can't wait to try Moo juice...mmmmm. Thank you for all your hard work! WOW WOW WOW!!!! The BEST!!! I've never, ever ordered a bottle bigger than 30 ml from any juice company, so this is a first for me...I ordered the small bottle of Churro with my first order, tried it straight out of the mail, and fell instantly in LOVE! YUMMM!! Just got done ordering the biggest bottle you have! Definitely my new ADV! :) I'd give you 10 stars if I could! My husband and I have tried a lot of other websites for juice...Churro is by far the best juice to vape with daily! Their customer service is impeccable! This is the only site I will ever buy from again... You will not be disappointed!!! My favorite desert flavor so far from any vendor including some of the "high end" juices. Pretty dang close to the real deal. I am vaping this in a rebuildable drip atomizer with a 2 ohm microcoil on a variable wattage device. Best flavor for me was experienced at 7.5-8 watts. I can see myself ordering more of this in the future it is so good. Definitely give it a try! After my first small order of Churro, I had to order a 50ml bottle. Definitely in my Top 5 Favorite ADVs. If you like churros this is a must try. Dead on taste. Amazing flavor!! A new favorite! I'm a newer vaper, also new to Alt Cig .just received my first order and am blown away! I purchased 5 flavors, so far I have only tried out Churro, simply because I cannot put it down! It is amazingly realistic, just like the warm Churro's I remember as kid..not too heavy on the cinnamon at all, this is a perfect blend! So far I'm thrilled with AltCig. My order arrived in 3 days and included a hand written note on the invoice telling me I had made great choices and thanking my for my order, which I thought was a nice touch..it made me smile. Shipping was very reasonable as well. Im sure I will be placing many more orders with this company in the future..thank you so much AltCig! I received this as a free gift from AltCig, and was amazingly surprised at how good this flavor was. I guess they hooked me on new flavor. I will be sure to order more once I run out and advise you to try this flavor, also you will not be disappointed. Thanks for the gift and I will order more when I run out, you guys are the best keep up the good work. I came back for more ! I have tried over a hundred different juices and this one of three I like, I guess I'm very hard to please. I love this it's the best. Next best thing to the real thing! Someone is a creative genius! This is my first vape of the day, everyday. Pairs beautifully with my morning coffee. How you guys captured the warm, fried taste is totally beyond me. Blows my mind every morning. Homerun right here boys and girls. 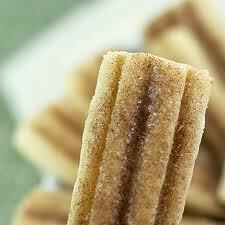 For those of you that might be saying, "What is a churro? ", remember the Taco Bell cinnamon twists? Yeah,...it's like that...hot...right out of the bag. If you like the Cinnamon Cheese Danish, then you will like this one. It is similar in taste, meaning it is WONDERFUL! I have been vaping this non stop since I got it. Thanks AltCig for another wonderful juice! This tastes exactly like a Churro.I buy them at the flea market when I go. Now I can have it without the calories. Sooo good. Altcig is the best!Amazing flavors. All day vape right here! This is just a great all day vape, doesn't disappoint throughout the day. It is rich and smooth. Almost like if you were smoking a real cigarette and eating a cinnamon twist at the same time, sweet but not too sweet. For me this beats the all day tabacco vapes that many have suggested and I keep coming back to it again and again. It's a winner. This is a very nicely done cinnamon inspired vape. They call it a churro, but so far I can taste more of a cinnamon-roll type of flavor, which is a good thing. Juice is very clean, great vapor and this is on the sweet side. Well done AltCig! With all the great liquids from AltCig, it is hard to stand out as the best. But this flavor does so. I don't know what to say other than echo what everyone else has already said. The best eliquid I have ever had. This juice could not be any more authentic. It smells and tastes so much like an actual churro, its scary. A good scary, that is! You will not be disappointed. I got this as a free sample (thanks!!) and I wish I had ordered a big bottle of it. I will next time. It is a deliciously sweet spiced doughnut with a 'fried' taste and the tingly sweetness of cinnamon sugar. It is really good. It is similar to snickerdoodle but more spicy and 'fried'. Delicious! This does taste just like a churro. I have to say Thank You altcig! I am very impressed by the flavors, price and quick service. This stuff is YUMMY! Yes, it does taste just like a churro - minus the grease factor. A light cinnamon with a fried pastry under-tone. I will have to buy me a the BIG bottle of this one. Just recieved it today it tastes just like the real thing i couldn't even believe it. I highly recommend it. I will be buying this again in the future. Got this as a free 15 mil sample and I like it a lot! It isn't too sweet at all. I'll be getting this again! This flavor in this churro is just fantastic. It tastes just like a a fresh churro. You taste all the yummy flavors just like the real thing, and wow just WOW* Love that it is not too spicy, but just right. If you love churros you will love this. Thank you altcig for this one, you did one amazing job with this. By far my favorite desert vape! This is such a great flavor. Try it and you will be hooked! A very well rounded e-liquid flavor! The first hour or so was a bit sweet but after that its just perfect. Such a full flavor. The cinnamon is very slight, very vanilla-ey and doughy. So close to a churro. Smooth yet satisfying throat hit, full vapor production. Thicker consistency so it's heats so nicely. Never a burnt taste. Using an ego vv with ce4(Stardust) around 4 volts. Shipping included 18ml total of awesome free samples and got my order in 3 days! I'm hooked ! You know those certain candles that make your house smell like your baking, like cinnamon bun or sugar cookie? This vapor has that full delicious aroma! Spiced Cookie is slightly spicy. This is even more slightly spicy. Churro just tastes delicious. The cinnamon is an afterthought, not overpowering. I am so picky about ejuice, and don't like much of it, but I am ADDICTED to Churro from AltCig. I haven't used it in a tank yet, but I LOVE how it crackles in my Stardust at 4.2 volts (Twist). Thanks, AltCig, for this wonderful juice. Definitely my favorite Altcig juice so far!!! This juice is delicious!! It tastes like a sweet doughnut with cinnamon on it. It's very cinnamon and sugar sweet!! Hard to put down!! Also great vapor. Highly recommend!!! This flavor is awesome. It tastes 100% like a churro. You taste all the flavors you are supposed to, there are no flavors there that shouldn't be, and it has a good after taste. If you like churros you will love this! If you love Churro's you are going to love this. Another one of my AltCig addictions. So simple yet so delicious. AltCig has nailed this one perfectly. Just the right blend of sweetness and a light bakery style Cinnamon. I've tried others but they're not even close. Grab a small bottle now just to try, and you'll be sorry you didn't order larger later. This to me tastes just like the cinnamon twists at taco bell. I blew through my small bottle in no time. Time to get a big bottle!! Delicious! This tastes like a real churro. No kidding it is wonderful! I must say another wonderful vape by AltCig! The cinnamon and flavor is so light and refreshing. And the exhale..I'm addicted! It is a buttery flavor. That's what it tastes like to me anyway. I've never tasted anything like it before. I highly recommend Churro. Never had churro but it looked good so i ordered it. The flavor is awesome. It reminds me of the aftertaste of eating a bowl of cinnamon toast crunch cereal. I vaped half the bottle in one day. I started to only taste vanilla unless i drank water or vaped a different flavor first, then the churro flavor came right back. definatley a top notch vape. I just received my order right out of the mailbox this juice is awesome! Tastes exactly like a fresh churro. I grew up with a mexican grandmother the taste and smell take me back to her kitchen! If your searching for the perfect churro you've found it here. I received this as a sample ... EXCELLENT JUICE. I ordered a larger bottle of it immediately. Sweetness and cinnamon (neither overpowering)and very smooth. Love it! Won't be without this one. Exactly like the real thing! I sometimes catch myself wondering if I've had a churro magically appear in my hand. It tastes that much like the real deal. Sweet, Cinnamony goodness. EXCELLENT! Almost afraid I'd gain weight from vaping this! All the flavor is good. I'd say it's a lesser cinnamon-y cousin to the Cinnamon cheese danish juice here(which I love). All around great. TH and vapor are there as per all the juices I've tried here. I can't give a better review for this product. It is lucious, wonderful and a must try! YUM! sweet, delicious, original. I never had real Churros so I was curios to know what it will taste like. Great job making this one, I tasted light cinnamon with maybe a touch of vanilla.It is somewhat sweet vape but not over the top sweet and will make you vape more and more. I only vaped about 3 ml so far and it fits right in with my fav juices ( vanilla, nanagram, Cinnamon cheese Danish ). 18mg , great vapor production, perfect smooth throat hit . Well done Altcig, another excellent juice. This is a very good juice! Very good vape could definitely puff on this all day long. If you are a fan of cinnamon and sugar churro you will love this!